I took a day trip to the central part of the state in early February in search of winter raptors. It's usually an incredible trip, as the hoards of pheasants and grouse in the region really attract winter raptors such as Rough-legged Hawks (often by the dozens! ), Ferruginous Hawks, Golden Eagles, Bald Eagles, and more. While I found some raptors, it ended up being one of the quietest winter days I've had on the Fort Pierre National Grasslands and surrounding area. 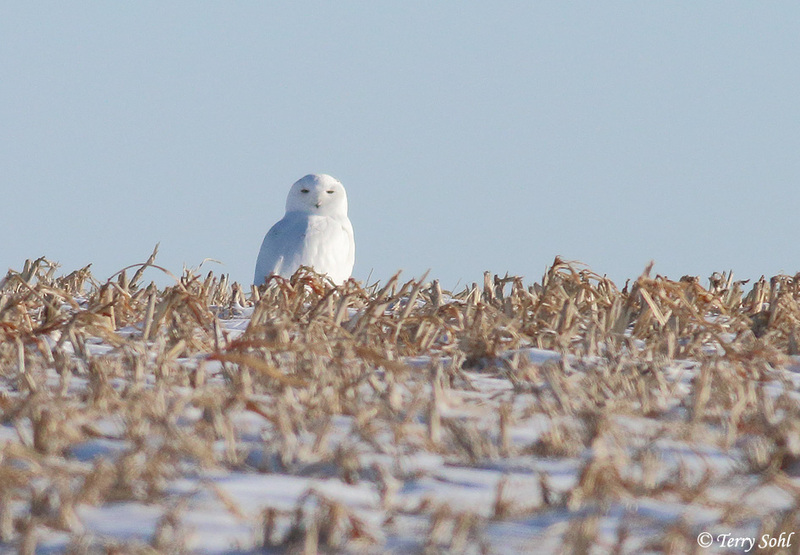 One bird that made up for the relative quiet, however, was this incredible Snowy Owl. Usually the Snowy Owls you find here are younger birds, birds with significant amounts of black barring. This bird was pure white, indicating it was almost certainly an older male. Gorgeous bird, but a bit camera shy! He flew when I first spotted him, preferring to observe me from a high spot on a nearby hill. I didn't pursue the matter as I didn't want to make him flush again, so I settled for this rather long-distance photo.